This comes from one of my all time favorite books, Goethe's Faust, the Bayard Taylor translation. I've done a couple different paintings of Faust, but this one is, by far, the most colorful. The scholar Faust yearns for worldly pleasures, and has just thought about making a pact with the Devil when Mephistopheles suddenly appears in a cloud of smoke with three appatitions to the astonishment of Faust. Everything about this painting says fire, from the red, orange, and yellow high ceiling study, to the pentagrams that appear on the floor. Vincent van Gogh always said "Painting as it is now promises to become more subtle. More like music, less like sculpture. Above all it promises color...Ah! To paint figures as Claude Monet paints landscape! That in spite of everything remains to be done." That was what I always strove for, especially early in my career and this was always one of my favorite examples of it. 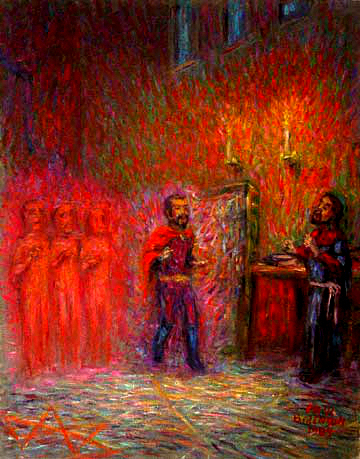 PaulB's Pointillistic/Impressionist original oil paintings of Faust and various prints and poster formats of a wide variety of subject matter by the Pointillistic/Impressionist oil painter from landscape/waterscape paintings, dance, sports, portrait, to classical figures, flowers, rock and roll, Brazil, and Faust paintings and prints are available for purchase for as little as $24.95 for an 8" x 10" matted print on photo pape. Pointillistic/Impressionist Giclee prints of Faust on real canvas or heavy watercolor paper are available. One of a kind Faust embellished prints, which are Giclee prints retouched in genuine oil paint by PaulB. Unless noted PaulB's original Pointillistic/Impressionist oil paintiings are oil on canvas. Paul Berenson's pointillistic/Impressionist oil paintings are in privale collections around the world, including the downtown Los Angeles Athletic Club and have appeared in numerous publications, including the New York Philharmonic Playbill. PaulB.com also builds websites and PaulB is a member of the LA Web Professionals Group.